When it comes to customizing your WordPress Theme or creating a custom theme, you need graphics and other bits of information to create a theme suited for your niche. Most bloggers hire a designer to put their vision into an actual functional design which can tend to cost a lot. Some bloggers purchase items to combine them to create their vision. One such place to purchase items to enhance your blog is Codester Marketplace. It’s similar to Mojo MarketPlace and ThemeForest but Codester is unique in their own way. 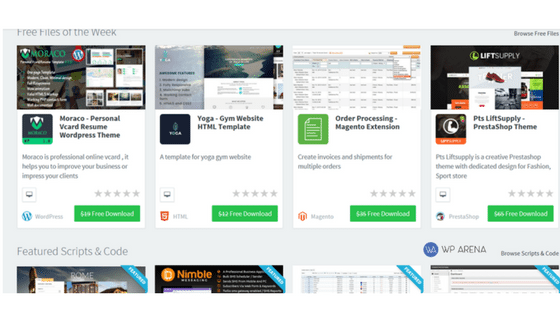 Codester is a place to purchase any of the following items: PHP scripts, app templates, themes, plugins, graphics, apps and templates for a website (non-WordPress templates) This marketplace is the all in one marketplace and is quickly gaining popularity in the WordPress community. If you are a web developer, you can join and sell your work on there. The more marketplaces you list your product, the chances of earning more revenue. After spending a while looking around, I have found numerous items I might purchase, but I am on a budget need to calm down. This blog post is going to talk about how this marketplace is useful to bloggers and even designers as you can sell your work in the market. Lets get started creating an account because without one, you will not be able to purchase anything and get support/updates. 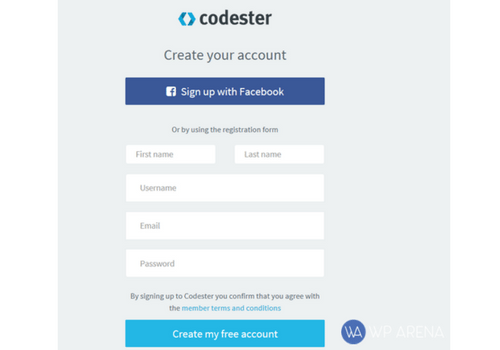 In the top right hand corner of the Codester marketplace, click on the “sign up” button. You should now be on the following page. For a comfortable registering experience, I would suggest just using Facebook like I did. Click on the Facebook button. Note that you might be prompted to log in to your Facebook account. After doing so, you should be on the following screen to complete the registration process. Just click on the continue button, and an email will be sent to you with your login name and temporary password. I’d suggest you change the password to something you can remember. You should now be on a screen to enter your mailing address. Please fill this out and continue. When finished, you should be automatically logged in. Make sure you edit your profile before browsing around to buy something. Codester provides several payment options when purchasing items. One of them is adding credit to your account. This is done by using your PayPal to deposit money into your Codester account to use for purchases. There are several options available for the amount to deposit. In addition to PayPal as a form of payment, you can use certain credit cards. I know PayPal has its limitations in certain countries, so it’s great they offer credit cards as an extra option. What I like about the Codester marketplace is the homepage. Their team displays freebies for the first section on the homepage. Yes, you can get some free stuff as a member. Who doesn’t like freebies? Make sure you visit the Free Files of the Week page to see a whole list. I’m a WordPress addict, so I’m naturally attracted to plugins and themes that I could tweak to work on a WordPress blog. There a lot of awesome items for sale in this marketplace and they are priced at an affordable price. When operating a blog, you have to be willing to invest money into your blog as the blog grows. If you look at a random listing, you will notice that you can read the reviews, look at any support questions asked and how did the author handle them. If the author is a jerk to customers, I won’t buy their product. Check out an example of listing you can view such information. Domains – If you bought a .com extension or another type of extension, consider buying other extensions such as .org .net .info so no one purchases one them and tries to sell it back to you. Protect your brand by owning multiple extensions and redirecting to the .com version. Email Subscription Provider – The money is in the list, you may have heard this catch phrase a lot. Investing in an email subscription website such as MailChimp which even has a free membership plan for bloggers just starting out. 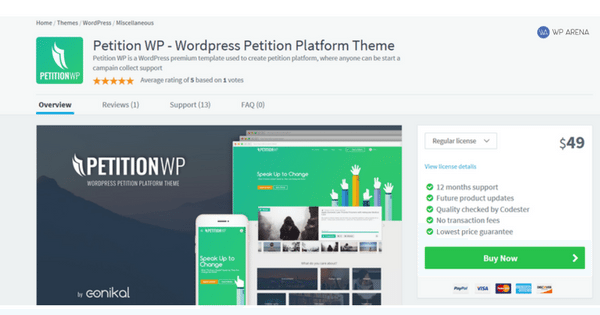 Theme – There are a lot of Free Themes advertised online on a lot of websites but there maybe a time when you want to invest in a premium one that has a lot of built-in features and caters to a certain niche. Have a look through Codesters WordPress Themes and find a lot of premium themes for multiple niches. Plugins – If you ask any blogger you run across and ask them if they install plugins on their blog, they will say yes and are needed for a blog to smoothly. Have a look through Codesters WordPress Plugins and you will find extraordinary plugins that can not be found in the official WordPress Plugin repository. What Is Included With A Purchase? That’s a very good question and I will tell you what you get with any purchase from Codester. When you buy anything on Codester, depending on what the author has stated, you get up to 12 months of support. You may have to spend a little more to extend support if needed. If a theme or a plugin is coded well and updated often, you shouldn’t need support on the plugin. Configuration of the environment the item has to work on. —> How do I apply for a refund? Before you join any website, always read their FAQ and if none of your questions have been answered, email support. When you get a moment, take a look at the Codester Help Section. Let me know if you have any issues with anything so we can discuss how to raise the issue to staff. 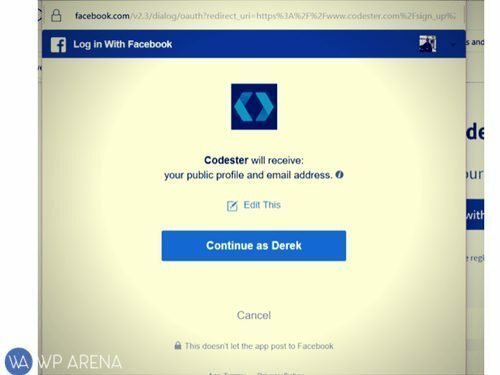 Grab Your Free Codester Account Today! Great site. I am already fed up with ThemeForest policies. Codester seems to be better than Themeforest.